Director On His New Tom Waits Video: "We Have Similar Crossed Wires"
When Tom Waits was inducted into the Rock and Roll Hall of Fame in 2011, he ended his acceptance speech with trademark Waits humor, stating, “Thank you very much, this has been very encouraging.” As one of the most respected performer-songwriters of the last forty years, Waits gained a cult following by looking forward while paying homage to the past, culling from blues, jazz and vaudeville influences to create his own sound, an amazing bourbon-soaked wail-grind, often relaying tales of the downtrodden with equal jiggers of heartbreak, hope and humor. His growling mode of transport could be classic piano ballad one day and a full-out modern industrial experiment the next. Waits’ seventeenth studio album BAD AS ME was released in November, and this week the video for “Hell Broke Luce” debuted online, instantly becoming a buzz among music video lovers and Waits’ fans alike. With Waits pulling a house through a fever-dreamed, thundercloud-shadowed world at war, the clip was helmed by Matt Mahurin, a director and photographer who can visualize a song with the unmistakably rich, dark imagery he used in videos for Metallica, Tracy Chapman and Alice in Chains. Mahurin spoke with THE GOLDEN AGE OF MUSIC VIDEO by email about working with Waits on this video. From a simple phone call from Tom that evolved into a challenging and fulfilling creative collaboration. You worked with Tom Waits previously (1999’s “Hold On”). Was it a different experience this time? And what exactly is it like working with Tom Waits? He is such a distinctive creative force, I imagine the experience is rather unique. Tom and I have worked together for almost thirty years, we have some similar crossed wires which generate some fun and challenging sparks. For me, his talent is only surpassed by his enjoyment and value as a person with whom to share thoughts on life, family and art. Finally, as Tom and I hopefully (yet somewhat begrudgingly) grow as people, so does the experience and results of working together also evolve and deepen. Tom and Kathleen [Brennan, Waits’ wife and collaborator] had a single image of a man pulling a house. I simply took that guy and his home on a journey through the angry, tragic and wrenching landscape of the song. Where did you shoot the live scenes? Tom’s performance was shot in California. How long did the post-production take, and what sort of technology did you pull in to accomplish these visuals? The post production was done over a couple weeks on one computer using Photoshop and Motion in my home studio. All the props, such as the house, shark submarine and vulture, I built and then worked into the live action images. I use no post-production facilities or effects house. I shoot, edit and compose all the shots… I think this one-man-band approach is connected to my background as a painter and wanting to have complete control over my medium. Also, Tom really prefers to work as simply and quickly as possible… so my approach suits him and makes for a smooth operation. Is there a lesson you learned early on in making music videos that you still apply today? Everyone sees images in their head when hearing a song. For some, it is an elaborate narrative that accompanies the lyrics… for others it may be bursts and swirls of color. What I have learned and is still true is that I must support the intention of the musician while also retaining my own personal point of view as an artist. It has been an amazing experience to see this little four minute film, which until just a few days ago, existed only inside my computer… is now spreading across the land and into the lives of hundreds of thousands of people who are curious and eager to be affected and respond… makes me feel both big and small at the same time. Finally, I am most grateful to Tom and Kathleen for entrusting me with such a powerful song and the opportunity to make my own humble, yet passionate statement about the horrors of war, and most importantly, the absurd and tragic toll it takes on young lives. 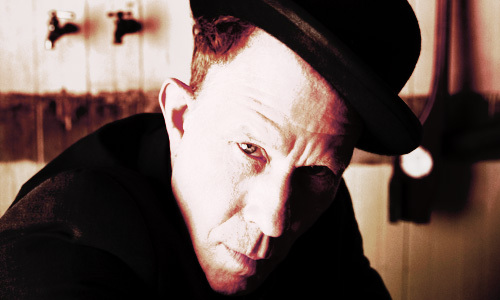 Check out Tom Waits’ “Hell Broke Luce”, directed by Matt Mahurin, right here.